Haji Payinda Mosque (also known as Masjid-i Nou Gunbad), Balkh, Afghanistan. Thought to be the earliest Islamic building in Afghanistan—and one of the earliest structures in the eastern Islamic world—the Mosque of Haji Piyada at Balkh was built in the ninth century, only 200 years after the birth of Islam and shortly after its introduction into Central Asia. A square mosque measuring 20 by 20 meters, Haji Piyada is also known as the Mosque of Noh Gumbad, for the nine cupolas that once covered its sanctuary. Although the cupolas have long since collapsed, the arches that once supported them still stand, albeit precariously. 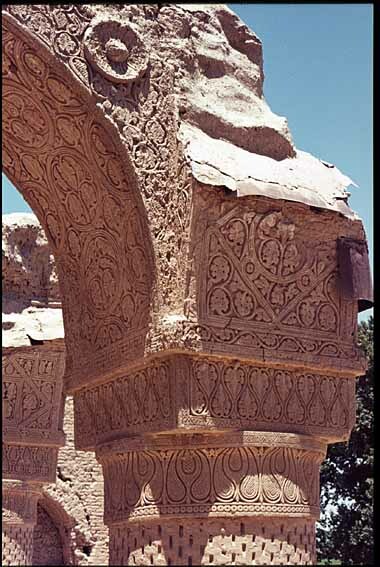 The arches, like much of the remaining interior surfaces if the mosque, are covered with exquisite, deeply carved stucco designs that exhibit a unique blend of imported Abbasid artistic elements and local traditional styles. Of unmatched art historical value, the Mosque of Haji Piyada is threatened by looting, high humidity, and erosion, which are taking their toll what has survived. Urgently needed measures to safeguard the site against further damage include the construction of a fence around its perimeter to prevent illicit excavations and the consolidation of surrounding walls to protect against harsh weather conditions. Decades of war and civil unrest in Afghanistan have made maintenance of the site all but impossible and have stripped the country of the capacity to carry out even basic conservation projects. It is hoped that Watch listing will not only highlight the need to preserve this extraordinary building, but also provide a laboratory for training a new generation of Afghan conservators. You are currently browsing the Safrangُ blog archives for April, 2007.